Presenter Jill Sonke, Co-Founder and Director of the Center for Arts in Healthcare Research and Education (CAHRE) at the University of Florida, will discuss the human and economic value of the arts in healthcare. At Shands Hospital, where Jill uses dance and movement in patient care, a patient's medical chart reads: "Dance works better than meds." This community presentation is free and open to the public. Please RSVP by April 3 to Robin Hicks, rahicks@kentuckycenter.org, 502.562.0715. This event is made possible in part through the generosity of the Humana Foundation, the Fund for the Arts, and the Society for Arts in Healthcare. About Jill Sonke: Jill Sonke is Co-Founder and Director of the Center for the Arts in Healthcare Research and Education (CAHRE) at the University of Florida, is on the faculty of the School of Theatre and Dance at the University of Florida, and is Assistant Director and Artist in Residence with Shands Arts in Medicine (AIM). She has been an Artist in Residence with AIM since 1994, when she founded the Dance for Life program. She is active in research, curriculum and program development a UF, serves as vice president on the Board of Directors of the Society for the Arts in Healthcare, and is a frequent presenter, consultant, and guest artist at universities, conferences, hospitals, and festivals throughout the United States and abroad. About The Kentucky Center's Arts in Healing Program: The Kentucky Center's Arts in Healing program bridges the arts and healthcare in Louisville, and serves as a resource for our community and region. In Kentucky and throughout the world, the arts are transforming the healing environment. As healthcare grows more technical and sophisticated, patients' anxiety and loss of control often rise. The arts humanize the healthcare setting, offering creating channels for expression, stress reduction, and enhancement of positive thought processes. Research has shown that the arts in healthcare settings can improve the quality of patient care and outcomes, increase staff satisfaction and retention (a pressing problem and financial burden for healthcare facilities), shorten hospital stays, reduce pain medication, and save healthcare dollars. For more information on The Kentucky Center's Arts in Healing program, please call Robin Hicks, Arts in Healing Manager, at 502.562.0715. Tags: "Arts in Healing", "arts in healthcare", "CAHRE", "Humana Foundation", "Jill Sonke", "Kentucky Center"
OK, this might feel like a shameless plug for Tuesday night's One Night of Queen concert, but who cares. Whether you see that show or not, you MUST WATCH THIS VIDEO! Do you hear me? You don't have a choice. I was in high school when Queen first exploded over the radio, and while, yes, I banged my head to Bohemian Rhapsody (who didn't?) I never got Freddie Mercury as this incredible performer. Until I saw him perform at Live Aid in Wembley Stadium. Oh yes, I only saw this video years and years later, after Freddie had left us. Too late. But not too late, either. To watch this clip is to relive the moment. Check it out 4:30 in. Who else could instantly choreograph 100,000 people with just a look? Remarkable stuff. The Kentucky Center officially introduced its new Arts in Healing program with a special workshop at the Frazier Rehabilitation Institute on Saturday, March 7. 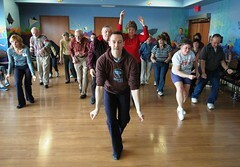 The free "Dance for Parkinson's" workshop was led by Mark Morris Dance Group company members John Heginbotham and David Leventhal. Persons with Parkinson's Disease and their caregivers participated in a class that combined elements of modern dance, ballet, jazz, social dancing, and Mark Morris company repertoire. While dancing, whether in chairs, at a barre, or standing, class participants were energized, enriched, and empowered, exploring movement set to live musical accompaniment in a welcoming environment. To view more photos from the activity, you can either click links under the photo in this post or click the Flickr badge link that appears in the upper left of this page. Tags: "Arts In Healing", "Frazier Rehab", "Kentucky Center", "Mark Morris Dance Group", "Parkinson's"
It's been a long time since I've watched the Miss America beauty pageant, but I remember the talent competition as being a collection of opera singers, Broadway belters, ballerinas, majorettes with flaming batons, etc. Can anyone remember a Miss America contestant that came out and played the blues to demonstrate her "talent"? 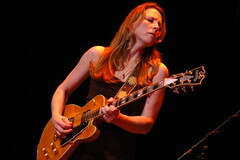 You can't tell it from this photo but Susan Tedeschi performed her electrifying November 2008 show at the Brown Theatre in a strappy ankle-length gown and high heels. You can see the full-length view if you check out our photos on Flickr. Surely she gets extra points for the added degree of difficulty in laying down the blues while looking like a babe. All she needs is a sparkly banner across her chest and a tiara. This Derby - all eyes are on you! Get ready with a complete head-to-toe style event at The Kentucky Center. Wednesday, April 15, 5:30 to 7:30 p.m.
See the hottest trends from Luna, Clodhoppers, Rodes, Korrect Optical, Joseph's Salon, Doncaster, Blink and Peacock. Plus, meet special guest Christine A. Moore, renowned New York hat designer with her latest, award-winning designs. Follow this link to view a selection of her colorful creations. Enjoy Derby-themed hors d'oeuvres and desserts. First drink is on us! Tickets are $45. Proceeds benefit The Kentucky Center. Tickets are available online, by phone (502.584.7777, 502.562.0730 TTY) or in person at The Kentucky Center box office. Access Services: Accessible seating and hearing amplification are available. Please reserve your access services when purchasing tickets through our box office. Is there a dress code at The Kentucky Center? This is a question we hear a lot! Wondering what to wear to see a show at the Center? Let this photo of Idina Menzel be your guide. Definitely not black tie or pearls. 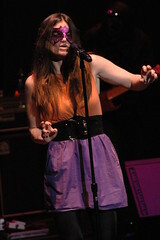 Of course, she was performing on Halloween night. Still - it looks like she obviously chose to "dress down" for the occassion. Idina is insanely talented and gorgeous to boot...the experience of her show in the Bomhard wasn't about what she wore. ood to know that even the gorgeous and gifted among us make a fashion faux pas once in awhile. We want our little girls to grow into strong, confident women - but women still pay a steep price for questioning authority and stepping outside established societal roles. I watched this trailer and got so mad that tears came to my eyes. The line that stuck in my head was "They want you to back down...and I don't cower easily." We invite you - and those strong girls you know - to the screening of 'Bama Girl, showing April 15, at 7 p.m., in Clark-Todd Hall at The Kentucky Center. 'Bama Girl follows a young black woman's quest to be Homecoming Queen at the University of Alabama, running against 15 other co-eds, a segregated Greek system, and a secret all-white group called 'The Machine' that's been controlling campus politics there for the last 100 years. Tickets are only $6.50. There will be a Q&A session with the filmmaker after the screening. As I sit here in my cubicle, surrounded by particle board cabinetry and dishwater brown upholstery, with the ventilation fan rattling overhead, under the greenish glow of the fluorescent lights, glasses sliding down my nose, I look at these concert photos and for a moment I'm transported. I'm no longer a desk jockey, I'm a Guitar Hero. I've got the stupefying power and charisma of Buddy Guy, the intensity of Jonny Lang, a cool zebra jacket like Eric Johnson and "good hair" like Kenny Wayne Shepherd. Not only are all these guys awesome musicians...but they "look cool" in a way that has fascinated me since high school and never been anything I could replicate. 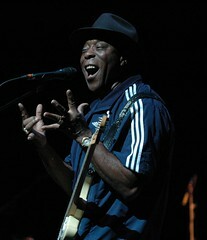 We've posted more pics from the October '08 'Experience Hendrix" tour on Flickr. They just might be the mental escape you're looking for on a Monday afternoon. Tags: "Buddy Guy", "Eric Johnson", "Experience Hendrix", "Guitar Hero", "Jonny Lang", "Kentucky Center", "Louisville arts"
Celebrity Sing-along: "Put Down the Duckie"
Do you ever get too old to enjoy Sesame Street? Enjoy this vintage clip with cameo appearances by John Candy, Jane Curtin and Ladysmith Black Mambazo to name but a few! SESAME STREET LIVE "Elmo Makes Music" is coming to the Brown Theatre March 27-29. Bring your little ones for singing, dancing, learning and FUN. Tags: "Brown Theatre", "Elmo Makes Music", "Elmo", "Kentucky Center", "Sesame Street Live", "Sesame Street"
"You're going out there a nobody, but you've got to come back a star!" I've blogged before about the recent rash (and pretty phenomenal success) of tribute shows. I'm not talking a simple cover band at a club, but a full-fledged, big stage, lights-and-pyrotechnic rock-and-roll extravaganza. If you saw our recent Pink Floyd Experience, you get the idea. (And if you loved that show, you've got to check out One Night of Queen, coming March 31.) It seems we can't get enough of big name acts, even if it's faux fun. Which got me thinking when I saw this story on MS-NBC. Seems you can pay fake paparazzi to hound your every step. It's your own, personalized "tribute band" experience! Be a big time superstar for as little as $729.99 and 30-minutes of your incredibly valuable celebrity time! Stretch that fifteen minutes of fame into a full half hour! Which raises two questions: 1) Can faux fame be real fun? And 2) If the passersby on the street start pointing at you and asking "Who is that?" haven't you turned your fake moment into real celebrity?